It may be dry this morning but enjoy it while it lasts as a band of heavy rain, coupled by strong winds, is set to move in this evening leading to more flooding for much of the country. The heavy rain is set to continue for most of the weekend and into the early days of next week. Winds are set to reach gale force tonight over much of Ireland and heavy winds are set to persist over the coming 30 hours. Upland areas are particularly at risk to flash flooding with up to 125 mm of rain forecast. There is also a strong chance that fallen trees will be a problem due to soil saturation levels and this could cause power outages tonight and tomorrow. Wicklow Weather are advising people who live near storm gullies, mountain streams and other water sources to take some preventative action today against flooding. People are also asked to avoid the Wicklow Mountains and all river and stream systems over the coming 120 hours. 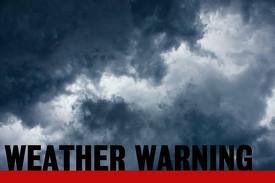 Wicklow Weather will be issuing updates on there Facebook page over the weekend so keep an eye on it. Met Eireann have also issued a status red alert, the highest available, for parts of the country.